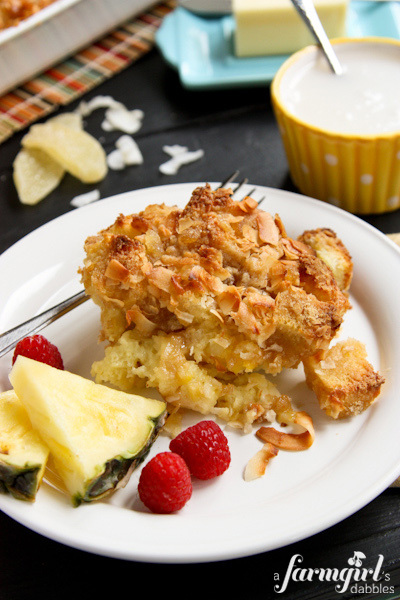 Crispity-crunchity on the top, and soft and eggy tender underneath, this Overnight Coconut-Ginger Baked French Toast has everything – EVERYTHING – going for it! Be sure to read to the end of this post… Enter to win 1 of 3 signed copies of The Pioneer Woman Cooks – A Year of Holidays! I absolutely love a big dish of breakfast that can be made the evening before, placed in the fridge to get all cozy in its flavors overnight, and then baked the next morning without lifting a finger except to preheat the oven. And Ree’s coconut and ginger baked French toast did not disappoint. My family has overwhelmingly approved it. My favorite overnight savory dish is a Prosciutto & Goat Cheese Egg Bake. It is spectacularly flavorful. Even people who don’t like eggs (our oldest daughter) or egg bakes (my husband) love this dish, and go in for seconds every single time I make it. And another recent favorite, more to the sweet side, is an Overnight Baked Apple Oatmeal with Crunchy Brown Sugar Streusel. It’s heavenly, and has won over my dad and mom. This overnight dish, though, deserves a whole different category. Might I suggest “dessert for breakfast”? It is sweet and gorgeously fragrant with coconut and ginger. 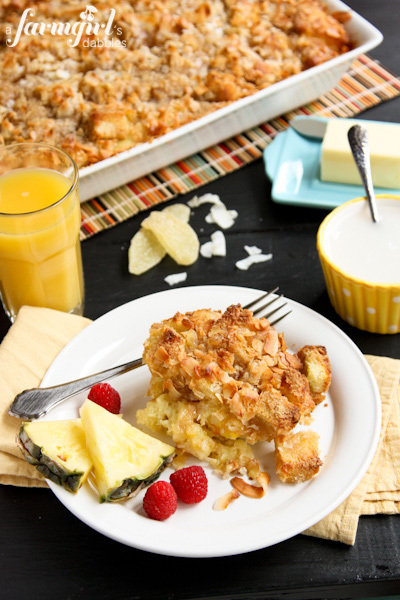 Crispity-crunchity on the top, and soft and eggy tender underneath, this French toast bake has everything – EVERYTHING – going for it. And I can even say that before I ever added a pat of softened butter and drizzled a bit of extra coconut cream yum over the top of my portion. 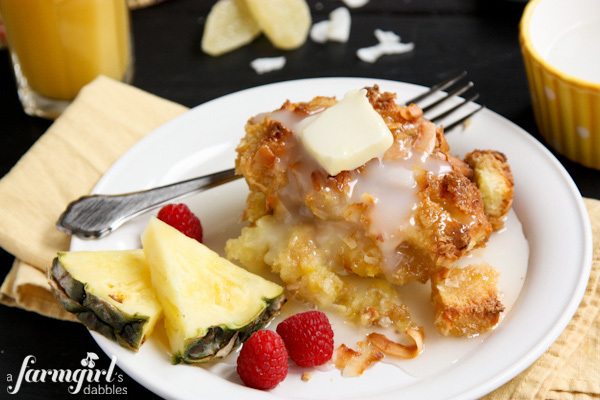 The French toast bake surely doesn’t need this extra bit of lovin’. It’s plenty wonderful without, but I think it’s the only way to go. And I’m 100% positive that MOM, who already makes so many of Ree’s recipes, will agree with me. I canNOT wait to make this dish for our next overnight guests. Hmmmmm…any takers for a night at the Score Hotel?? Cut or tear the bread into chunks, about 1″ in size. Place in a 9″ x 13” buttered pan or casserole dish. In a large bowl, combine the cream of coconut (give the can a stir to smooth it out), milk, cream, ginger, eggs, sugar, vanilla extract, and coconut extract. Whisk until smooth and then stir in the coconut flakes. Pour mixture over the surface of the bread. In a medium bowl, combine the butter, flour, brown sugar, ground ginger, and salt. Cut it together until it’s crumbly and combined, then stir in the candied ginger and coconut flakes. Sprinkle topping evenly over the soaked bread, then cover the dish with foil and refrigerate for several hours or overnight. When you’re ready to bake the French toast, preheat oven to 350°. 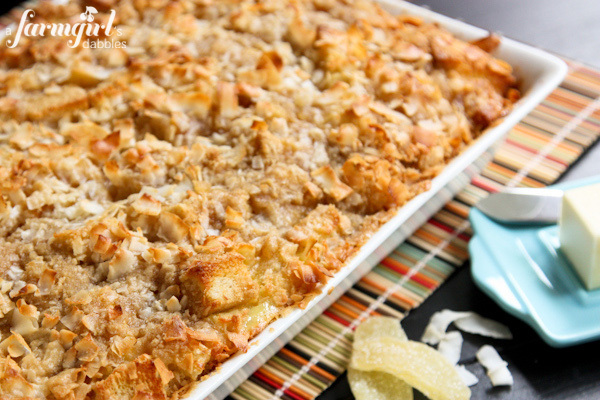 Bake for 45 minutes to 1 hour for a softer casserole, or a little longer for a firmer French toast with a crisper topping. When the French toast is done, drizzle a bit of the remaining cream of coconut over the top, if desired. Cool for 15 minutes before serving. 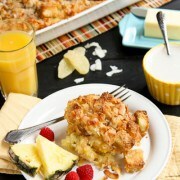 Serve with softened butter and warm maple syrup or additional cream of coconut. Recipe from The Pioneer Woman Cooks – A Year of Holidays. 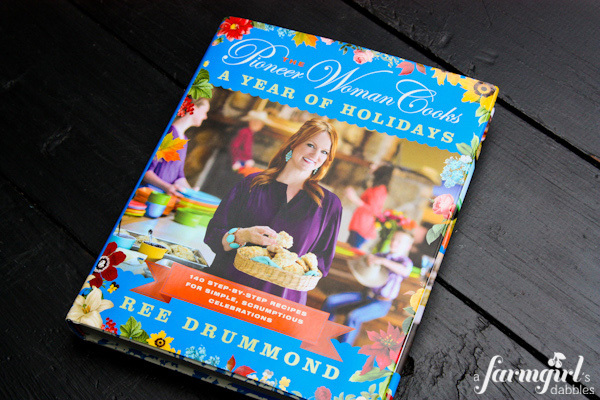 Win 1 of 3 signed copies of The Pioneer Woman Cooks – A Year of Holidays! Isn’t Ree’s latest book just so pretty?! 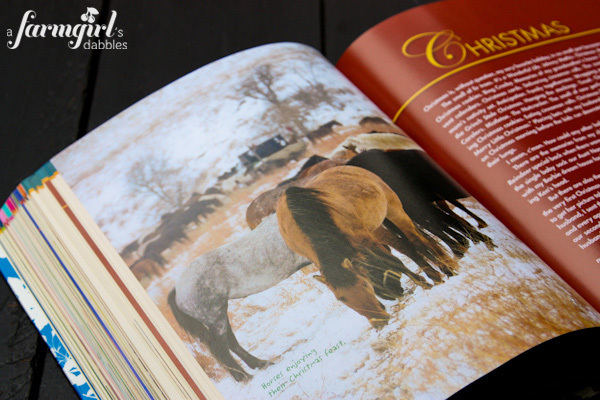 It begs you to hold it, to page through it, and to step into her family’s life through a year of holidays on the ranch. It’s so much more than a cookbook. Filled with heartwarming and witty and often laughable stories, plus awesome ranch photos and enticing recipes, I’m certain this book is going to get alot of use around here. I met Ree for the first time about a year ago, with our daughters, at a book signing at Mall Of America. Ree was so warm and lovely to Hatti & Tessa – she really made a lasting impression on their young minds. That experience still plays a big part in their wanting to watch Ree’s show on Food Network, and they especially enjoy when we make one of her recipes. …or a Charlie fix. She thinks that dog is cute and funny and adorable, and always loves when he makes an appearance on Ree’s Food Network show. I had to laugh when I got to the Acknowledgements in the back. 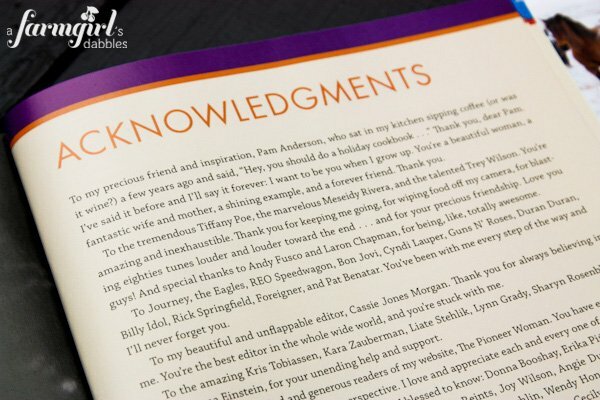 To the paragraph where Ree thanks almost a dozen bands/singers from the 80’s for being with her during the cookbook writing process. Ree’s good like that, always keeping it real. Always making you smile. And I can totally relate…sometimes a little “Sweet Child ‘o Mine”, cranked a little too loud, is the only way to get the job done. The Pioneer Woman Cooks – A Year of Holidays is a wonderful book that I hope finds its way under many a Christmas tree this year. It’s filled with scrumptious recipes to make any celebration a special and delicious one. Win 1 of 3 signed copies of Ree’s new cookbook! Just use the Rafflecopter widget below! Giveaway rules: This giveaway is open to US residents 18 years and older. Three winners will be chosen at random and then notified by email. Each winner will have 48 hours to respond and claim their prize, or another winner will be selected. 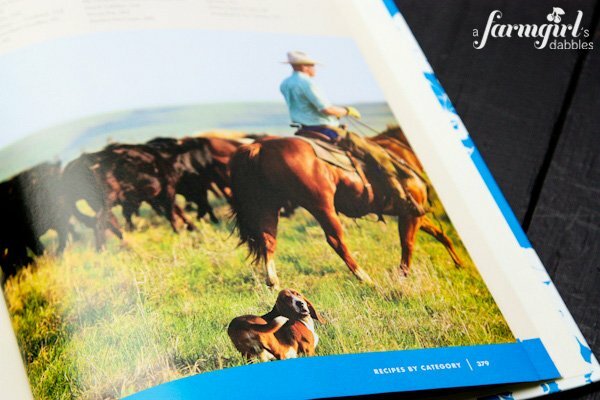 A farmgirl’s dabbles and The Pioneer Woman are not responsible for lost or undelivered emails. 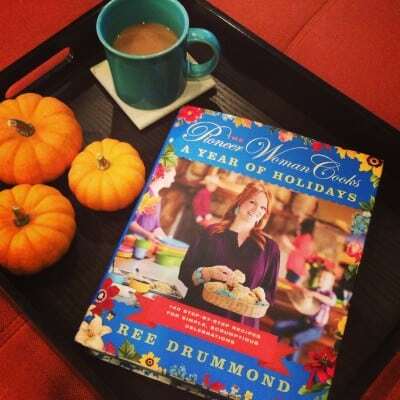 Disclosure: Thank you, Ree, for sending me a copy of “The Pioneer Woman Cooks – A Year of Holidays”, and for providing the copies for this giveaway. All opinions are my own.